Visalia, California is a beautiful city situated in the fertile San Joaquin Valley. As you might expect, the area is sustained by agriculture. But in truth, Tulare County is one of the most productive agricultural counties in the entire United States; and Visalia is the economic and institution center of Tulare County. While there are all sorts of delightful parks, farmers markets, and cultural events happening in and around Visalia, it can be hard to appreciate these perks when you are living in debt. Debt affects people all over America, California and even Tulare County. Fortunately, there are options available to those looking to get out of debt. What’s Debt Consolidation in Visalia All About? You may have heard about debt consolidation before. It’s a popular debt relief service that covers several outstanding debts (due to delinquent credit cards, skyrocketing medical bills, overdue personal loans, etc.) with a single consolidating loan. So, rather than having to pay off multiple debts (further complicated by multiple due dates, interest rates and payment terms), you simply make payments to one consolidation lender. If you are burdened with $10,000 or more in debt, you may be a candidate for debt consolidation. For Visalia residents interested in debt consolidation, it’s important to note that there are secured and unsecured consolidation loans. Secured loans leverage high-value assets like a home or car, in exchange for a low-interest loan. While this may sound like a good thing, it’s imperative that you make payments on time so as not to put your assets at risk. Unsecured consolidation loans are scarce compared to secured loans, and they usually come with hefty interest rates. But, on the other hand, they do not require the leveraging of high-value assets. If you are curious to learn whether you might qualify for a debt consolidation loan, call 800-910-0065. Certified debt experts are standing by to help answer your questions and provide direction for Visalia residents in debt. The call is free. Debt resolution is a form a debt relief which decreases the total amount owed. This is helpful for debtors looking to get out of debt for less, and helpful for creditors looking to recoup some of their dues. 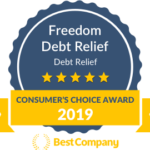 If you are interested in debt resolution (also called “debt settlement”), you should consider working with a company like Freedom Debt Relief. Debt experts can negotiate with creditors on your behalf. Keep in mind that the IRS requires you to pay taxes on your resolved debt, and the whole process might negatively affect your credit score. Sometimes your financial situation is in need of a delicate touch, rather than a complete overhaul. If you think this describes your situation, it might be time to explore credit counseling. Credit counselors provide guidance to those who need a little help building their budget, assessing their debt, understanding their credit score, and more. While it’s not a magic bullet, it can be an essential service to getting your personal finances back in order. What Can You Tell Me About Debt Management? Of course, credit counselors can also point you in the direction of additional debt relief programs and services. For example, debt management programs assist people wrestling with excessive credit card dues, overdue personal loans, and other forms of unsecured debt. If you are struggling to remedy your debt on your own, a debt management program can aid you in making timely monthly payments – thus helping you get over your debt more quickly. Debt management programs won’t solve everybody’s problems, but for those who need it, it’s an invaluable service. Is Bankruptcy as Scary as It Seems? As you might know, bankruptcy is a debt relief option with a lot of baggage. While it’s true that bankruptcy can eliminate many types of debt (including outstanding credit card balances, soaring medical bills, certain forms of personal loans, and the like), it can also negatively impact your credit score and assets. For instance, Chapter 7 bankruptcy often requires debtors to liquidate their assets (including their home) to pay off or satisfy creditors. Conversely, Chapter 13 bankruptcy generally allows debtors to keep their homes and assets, but still requires payments to be made to lenders. And since both forms of bankruptcy can damage one’s debt for years to come, these options should only be used in the most dire of circumstances. If you are unsure about what to do with your debt, call 800-910-0065 or visit Freedom Debt Relief online to speak with a debt expert today. We are more than happy to provide context on each debt solution to help to find the best option for your needs. Don’t delay. It’s about time you found a path out of debt. Get started by calling or visiting Freedom Debt Relief today!